I have worked on a number of websites and systems. Some of which I maintain on a regular basis. Developing systems and sites for Internet or Intranet purposes is something I really enjoy. It's great to see your work being used by its users. The following websites are a selection of some of my early work displaying that everyone has humble beginnings. There are also examples of some of my latest work for major international entities. 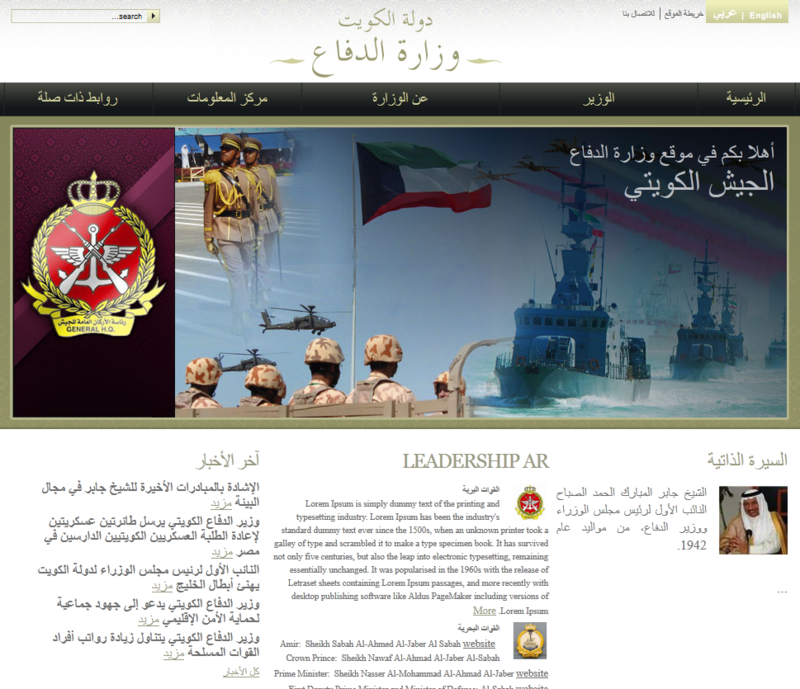 I received this project on sub contract, to theme and develop a Druapl6 CMS website, for the Kuwaiti MOD. 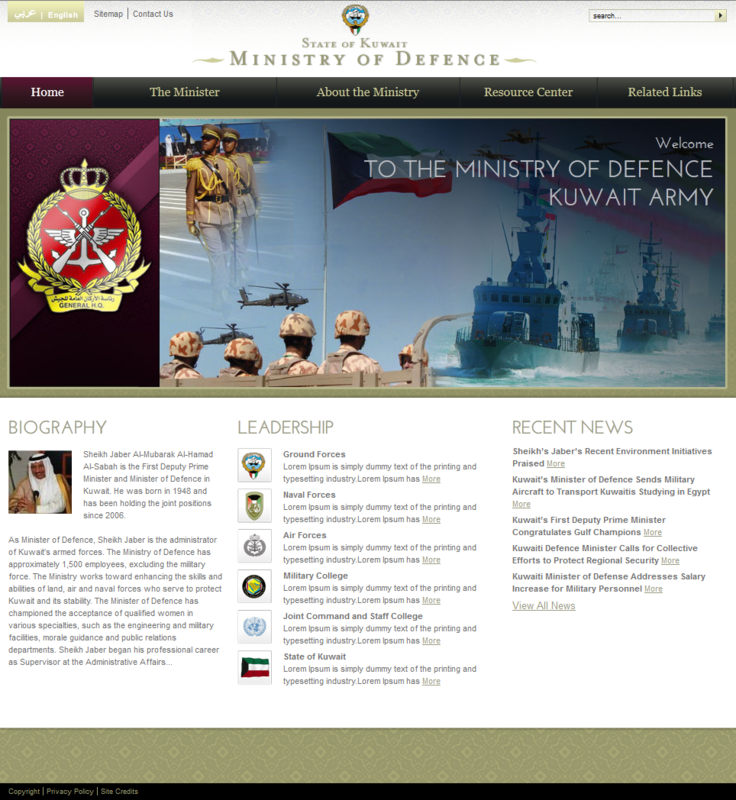 The site included the usual CMS style features. This was my first Right-To-Left localisation (Arabic) website project, a very interesting challenge to make it work across all modern browsers and platforms. This site made use of the 960 grid system. This cut out a very large amount of manual HTML/CSS positioning work and made the project much easier and faster to deliver. In 2011 GameOn created a dedicated new division, with a new name and look, called Game Grin (GG). GG was to become the online arm of the business while GameOn (GO) would focus on offline operations. A major factor in this decision was the clash of usage of the GameOn brand in other markets and with competitors in the same sector. Per my Technical Operations role, I took care of the servers and technology stack behind the new division. I would also contribute content when I had the time and it was in my area of expertise. Timescale: I managed the web-cashier component from 2007 to 2011. 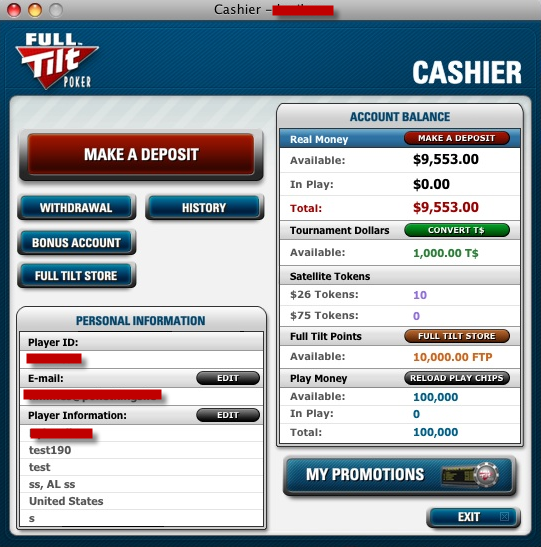 In 2007, not long after starting work within the framework team, I migrated into the role of managing the web-cashier component of Full Tilt Poker. During my time in the role, the team grew from 1 person (me) to 8 in a few years. The team also actively assisted in the development and maintenance of the web framework powering Full Tilt many web apps and sites. 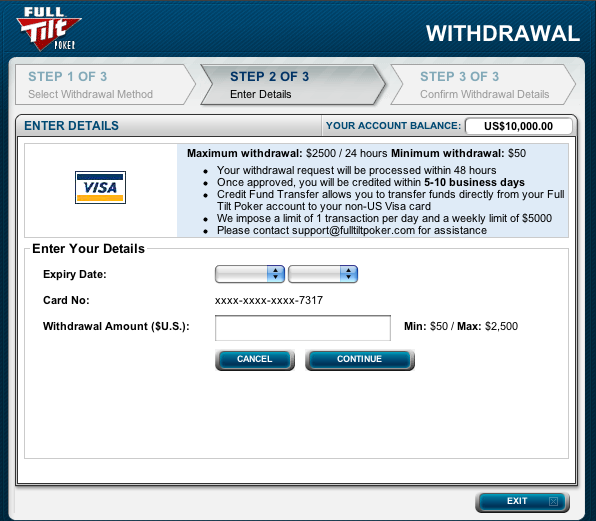 The web-cashier component was accessible/integrated from the poker game client software. It was only available via the client. The cashier can be thought of as a virtual teller in a Casio. 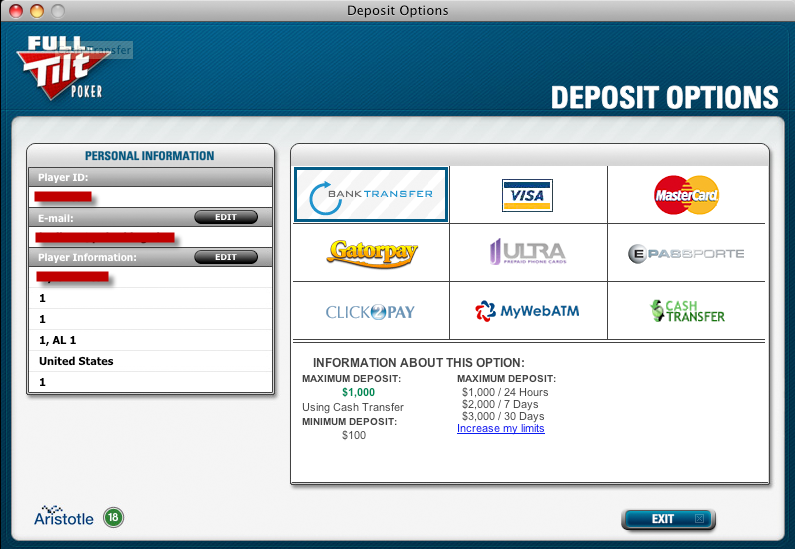 Generally speaking, in the deposit section, you would turn money into chips in your Full Tilt account and vice versa, you would turn chips in to money in the withdrawals section. There were also sections for performing internal player-to-player transfers and other financial operations. I managed all technical aspects of the component and lead of team of 8 developers and architects. We made software releases with improvements and bug fixes weekly. We used a custom agile project management approach. We were pioneers in the company, for our agility, the time it took as business idea to become a live feature was very short. The web-cashier being web based, could release changes independently of the main poker client software, which had a much longer development cycle. 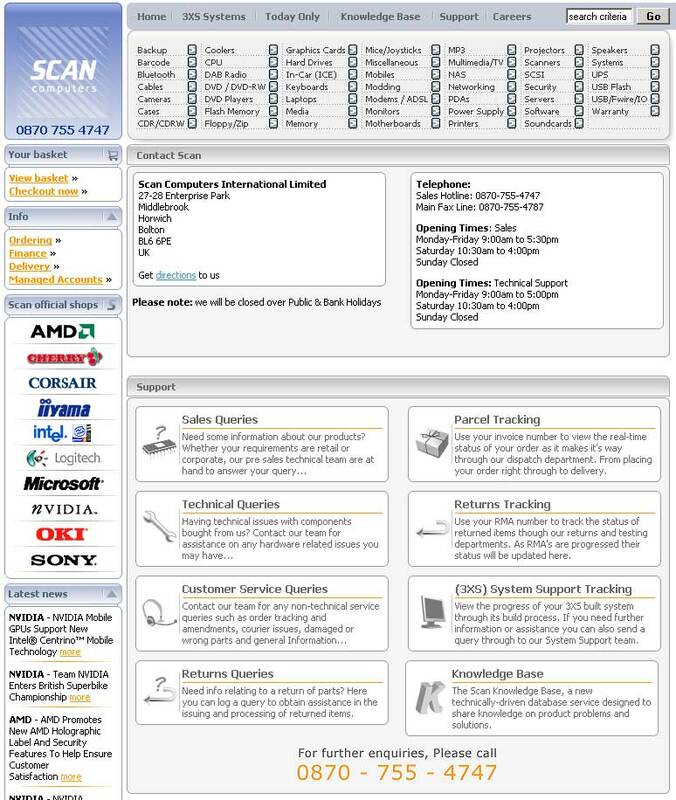 I dealt with the hardware clusters and datacentres for the web-cashier component, all aspects of the software and hardware architecture, performance monitoring and alerting, future-proofing etc. I was assisted by the Linux Infrastructure team. Assisted by the Linux Infrastructure team, I helped get CFEngine online in the test, staging and production environments, to help manage the software and hardware configurations and make the environments as close as possible. We tried to ensure we tested via VM -> QA -> STAGING -> PROD for all changes, software, cfg, hardware. I provided on-the-job training sessions for the team, to be proficient in troubleshooting the web-cashier component within the production environment and established an on-call rota which made the team available 24/7 to assist with production alert scenarios. Full Tilt was a 24/7 operation and had a very high traffic throughput with millions of hits per month, with 100,000's of players connected to the gaming system concurrently. Timescale: I worked on the web framework from 2007 to 2011. 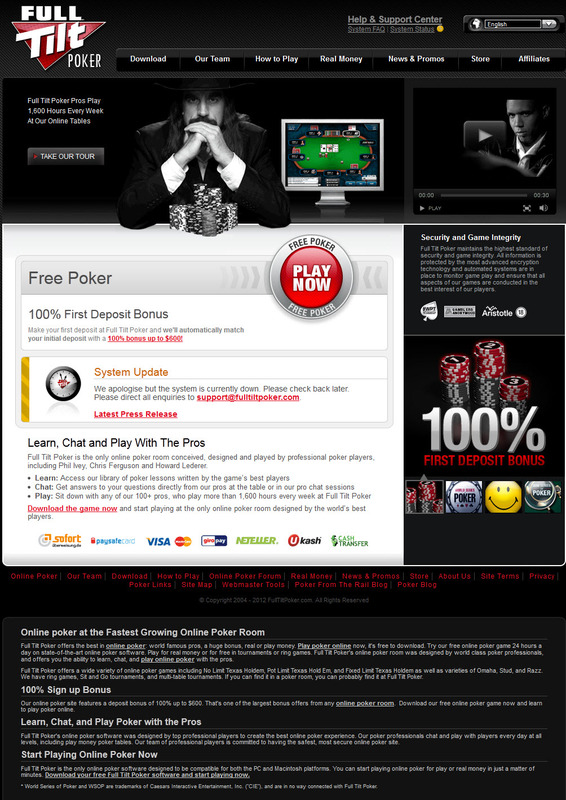 Full Tilt Poker was a top 2 online poker firm up until 2011. 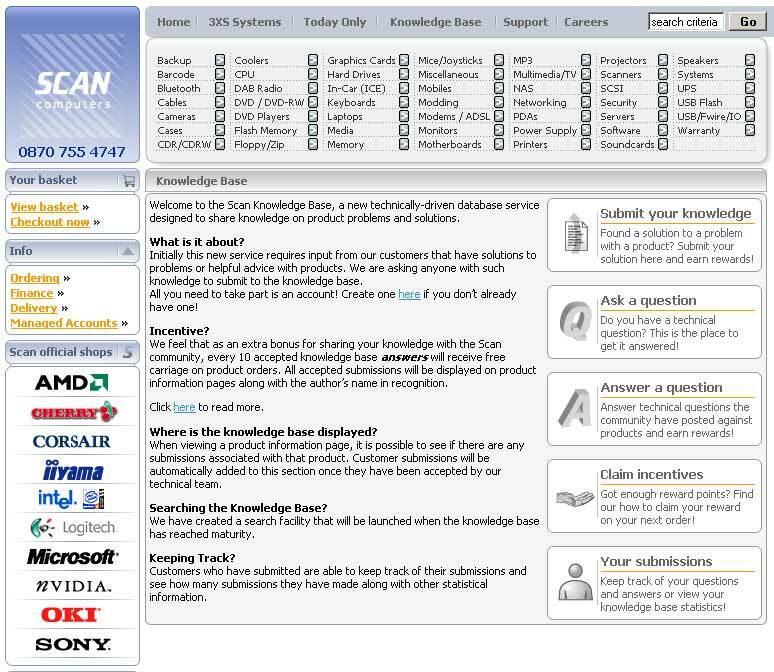 The website was the front door to the online operation; latterly operations were based in Dublin and hosted between two data centres, one in North America and one in Western Europe. I took a role in the web team in 2007 to help with framework architecture and application development. The PHP5 framework ran the large majority of Full Tilt websites and applications, of which there were many. Some customer facing but most that were indirect or internal systems. 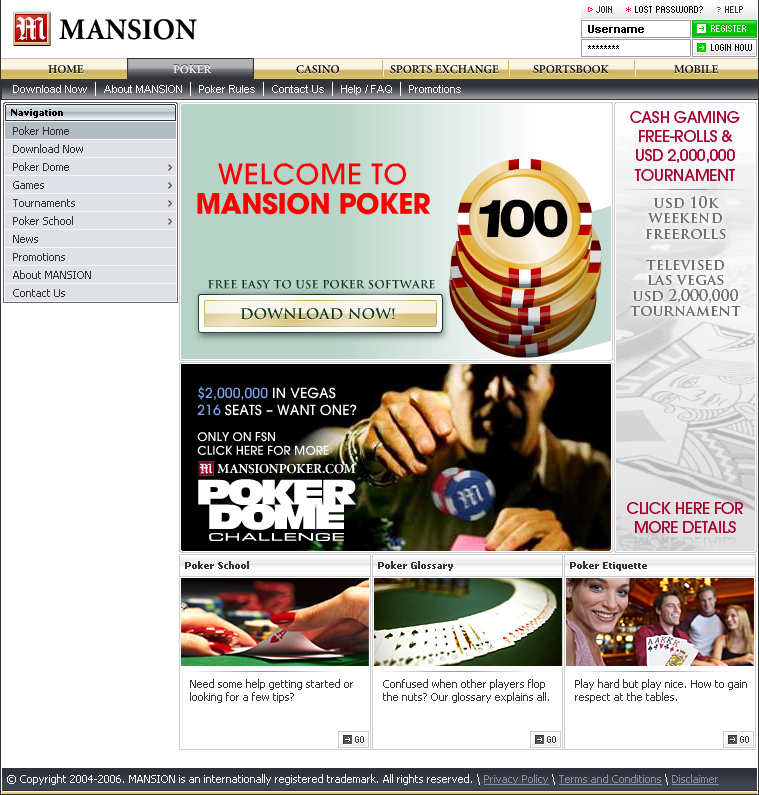 A number of the web applications were only accessible via the Poker game client, and behaved just like a classic application. Timescale: Constantly under development, started around 2004. 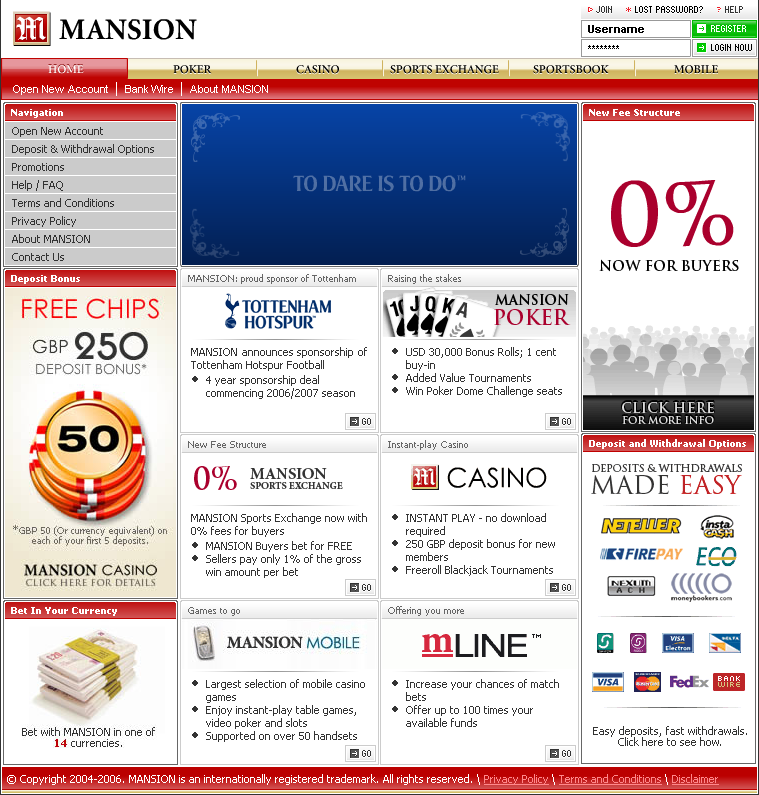 MANSION.com is the main portal for MANSION (Gibraltar) Limited, which is a purely web based online gambling operation based out of Gibraltar. I was the Portal Operations Manager. 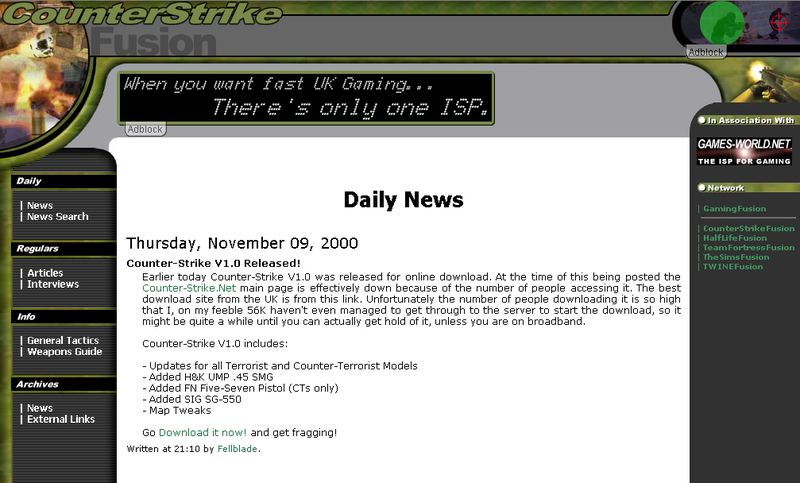 I got on board with the operation in October 2005 as a global webmaster and moved in to the management roll later on. 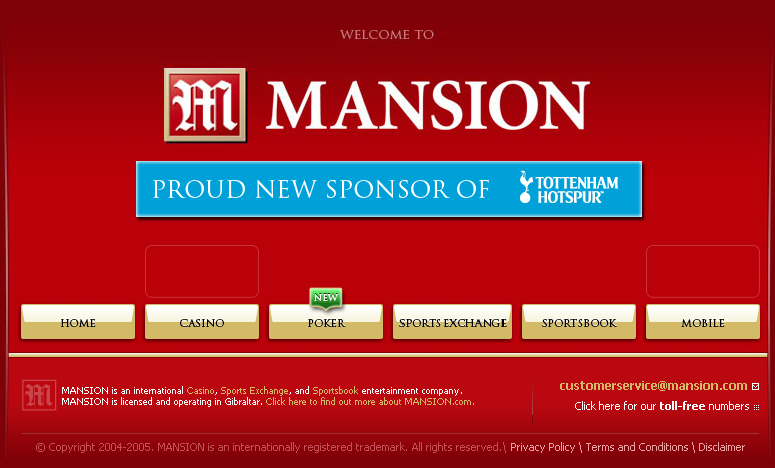 I worked at MANSION until 2007. The Portal is made up of multiple platforms and architectures, and has the common products of websites of its nature, Casinos, Online Poker, Sports betting etc. I was responsible for the technical aspects of Portal upkeep, content accuracy and management. This was a demanding role, as the portal is constantly changing, in multiple areas, with each area of the business having its own requirements for updates and changes. 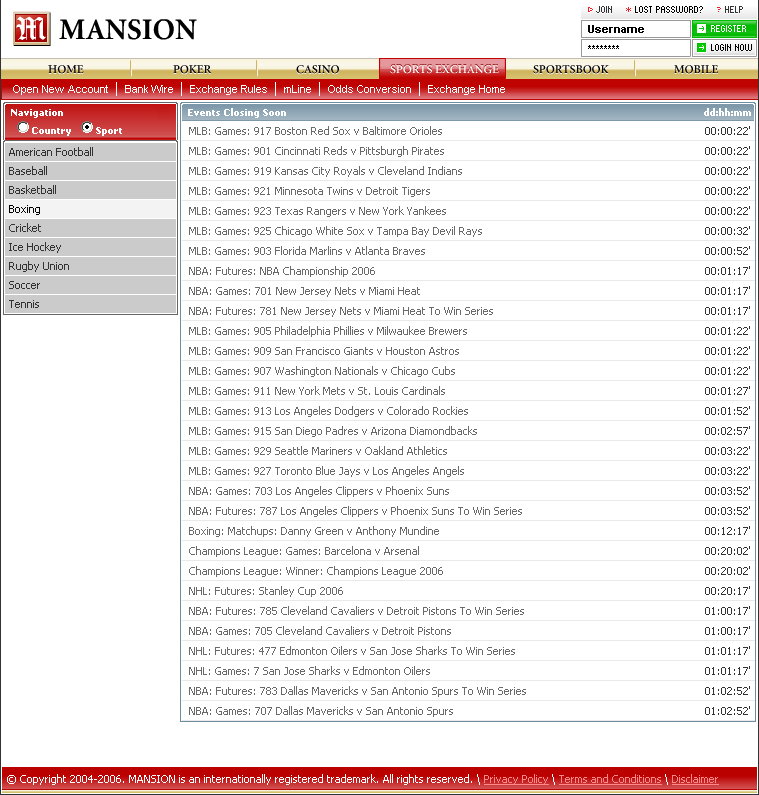 MANSION was a 24/7 operation and has a very high traffic throughput with millions of hits per month. Another site utilising my PHP CMS technologies, this time my own personal website. Content for this has been collecting dust for 6 years, finally got around to putting some of it online. The template for the site was completed 3 years ago, and has actually been borrowed by other projects before kylemilnes.com went online. 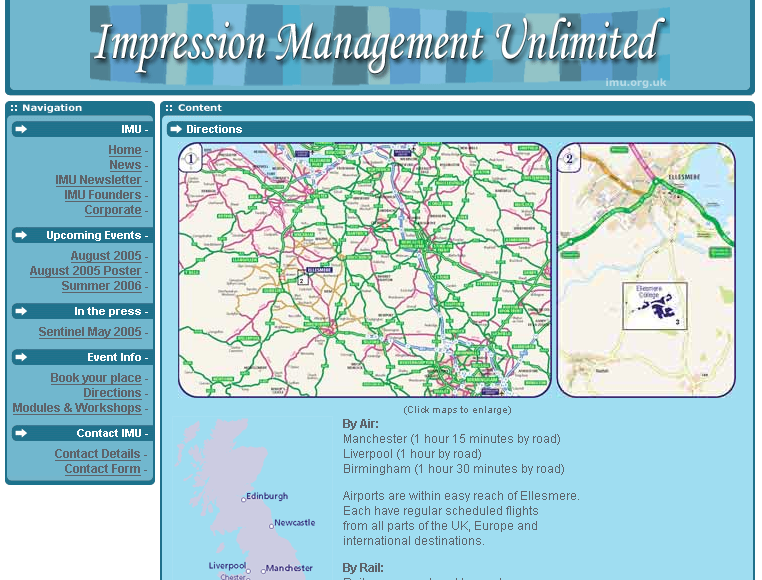 This was another simple project utilising my PHP CMS technologies. Does exactly what it says on the tin, with the template adapted from this website. This was a simple project with minimal specification. The main reason behind this is because it's my parent's business website. All the idea's and content was provided on demand. 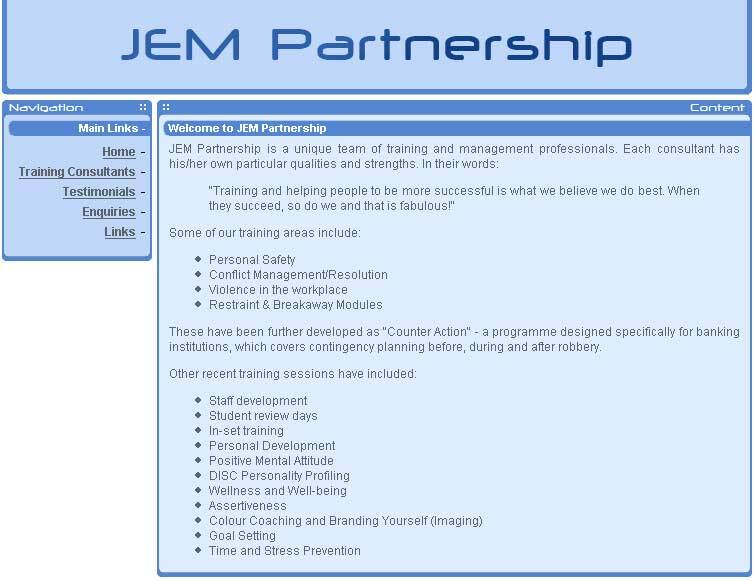 The template was taken from my own personal website and modified to suite the needs of JEM Partnership. Photoshop was used to create the original and modify and colorize the new one for JEM. Dreamweaver was used to craft the tables to hold the template and then hand coding of the simple PHP back end that looks after content delivery. A very simple yet effective HTML + PHP combo, this site does exact what it says on the tin. 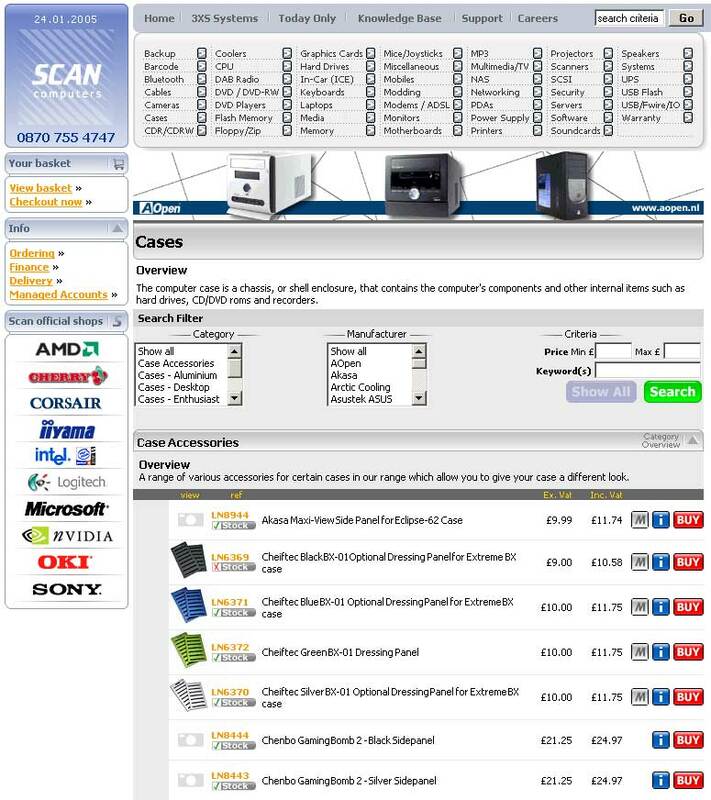 When I joined the Scan team in May 2003 the existing website was already very well developed. There were however some large downsides to the website. Due to its bespoke nature and the offline systems that supported it, the websites content was simple enough to keep up-to-date, however problems arose when anyone wanted to make major changes or new feature additions that integrated into the existing infrastructure. The main problem was the man hours that were needed to get things done. The directors of the company were already having ideas about a new website. The existing site was getting old. We had also proven through log and trend analysis of the existing site that some areas were ineffective and weren't doing the job required. Like most people within the Scan team, my skill set isn't fixed to one particular area within web development so I tend to get involved if only verbally at all stages of development. My main role in the new site project was to assist the lead programmer with the core of the system back end which would glue the site and its sub sites together. The back end was supported my multiple COM .dll's which help all the objects, functions and methods for the core website and systems. ASP then provided a pulled everything together using windows 2000 servers. Secondary goals were helping out with the GUI when asked for my opinion by the design team. I coded the knowledge base and developed the search engine that returned products based on users search criteria which had traverse a multi - multi-million record tables which required some serious SQL code and good use of indexing, which also paid off in other areas of the site. As a development team we really came together when faced with the tough challenges set out by the projects specification. Another challenge that the team faced due to the extremely high traffic the Scan site receives was to make sure we had ample hardware and bandwidth. I'm glad to say that two or three days after the launch of the new site we knew that we had made the right choices. 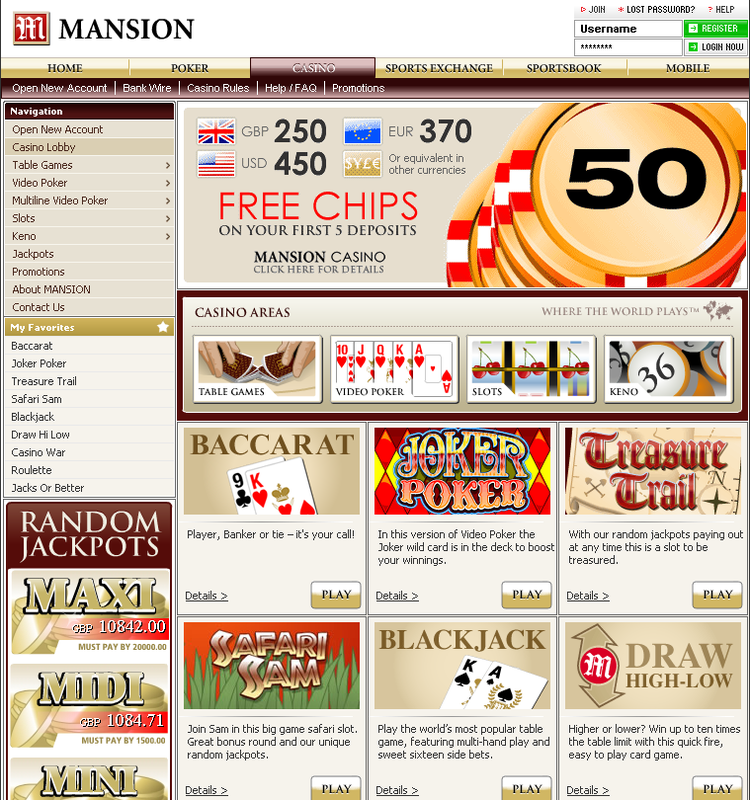 GameOn Network Ltd is one of the UK's leading LAN Party companies. I first heard of GameOn when a colleague suggested I should attend one of their events as I'm an avid multiplayer gamer. That lead to developing a friendship with GameOn Managing Director Steve Greenfield. Fuelled by our passions for everything to do with gaming we teamed up and I started to take an active role within the company. It wasn't long until we got on to the topic of the GameOn website. Due to unforeseen circumstances the lead developer working with GameOn had to pull away from the scene. It was only natural that I pick up where he left off. In late 2002 Steve and I planned out the huge specification for the new system that we both felt was needed to take GameOn forward. As always Steve really is ahead of the game with his ideas and his foresight is truly something to behold. It wasn't long before we had far too much to even contemplate coding all in one go. We gave ourselves a three month deadline to have the foundations of a new system in place with realistic goals at what could be completed within that time. So we had the system split up into manageable chunks that could be developed in a modular fashion. 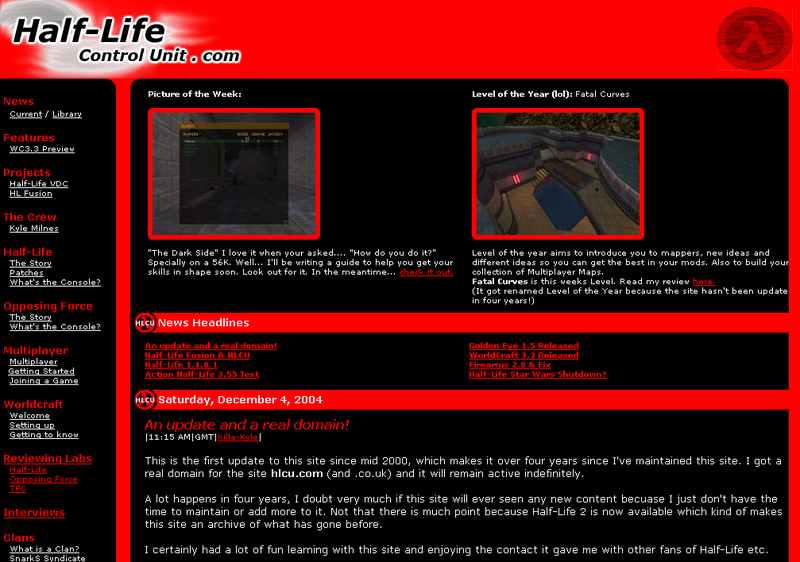 On January 1st 2003 the foundations and new site design went live to the community and we felt it got a good reception. As this system was my first major undertaking with PHP and Linux the first stage was really pushing the boundaries of the platform and language to see what was possible. I was surprisingly met with a near limitless development platform which I felt gave far more scope than anything Microsoft had to offer at the time. The core system is moulded around the idea that we wanted a system that supported an unlimited number of sub systems and sites. For this everything need to be modular and reusable so the bulk of the system code is functions and classes that allow the developer to create sites with very little program code required. The main work was creating the GUI to allow administrators to mange and create new sites and systems and manage exist sites and their content. Then there is the cascading permissions system which specifies what users can see and do and on which sites and systems they can see and do it. The template system is built around the idea that there are multiple templates available made up from CSS and images and combined to give the look and feel of a site. 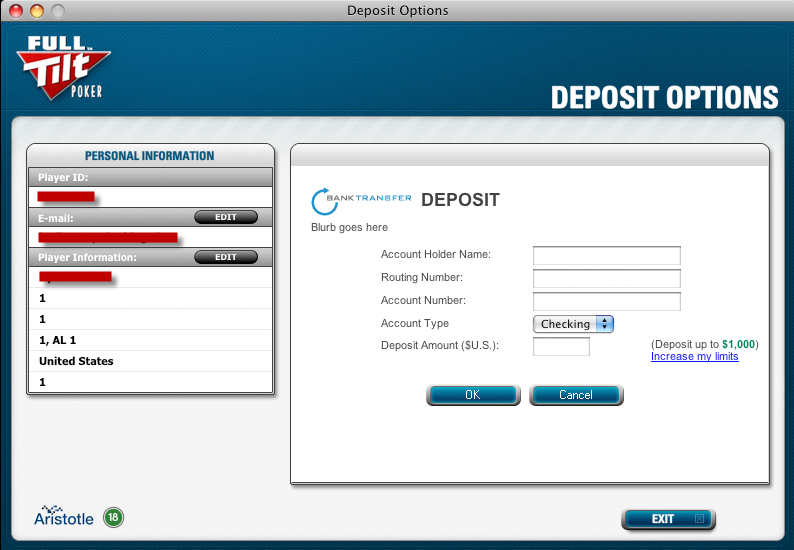 When creating or editing a site an administrator can choose the look and feel from the templates available on the fly. Modules were a big part of the original specification. By creating all sub sections of sites as modules and sub modules administrators of sites can choose which modules they want on their site from those available. This means a module only has to be written once and then it's available for all sites on the system. All the content delivery features are modules that can be turned on and off. Examples are: News, Columns, Reviews, and Interviews. When we started planning for the system GameOn already had 1000's of registered members all of which had signed up via the community forums. All user data was stored in the forum database. One of the major coding challenges was integrating into this data source without causing problems for either the new system or the forums. Maintenance: Code has now reached final release. This was my first long term project purely because of the scale and scope of works. 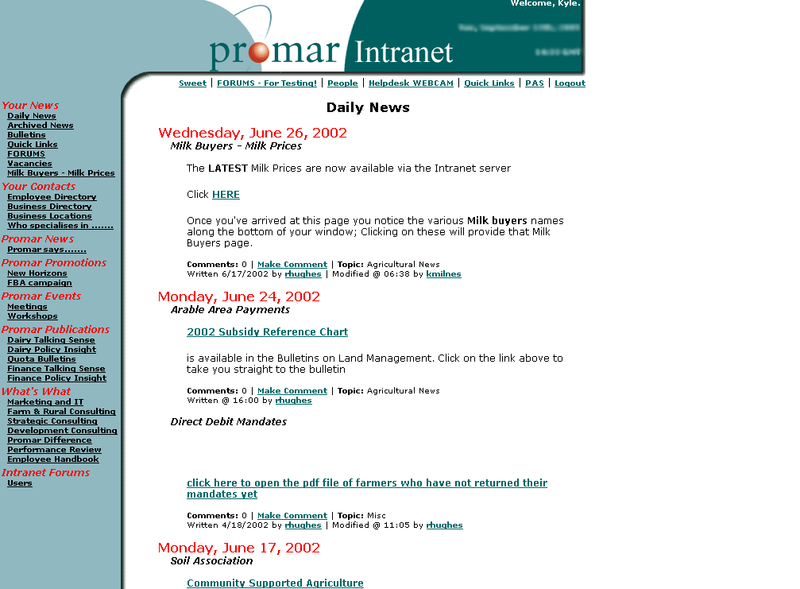 Promar International, the IT/IS arm of Genus PLC had a budget for a corporate intranet to be developed and implemented with internal access and access from any office or location in the world for consultants in the field. My responsibility was to deliver as specified within the contract and project schedule. After setting up the initial HTML template and GFX, the webserver for testing, developing and designing the core of the code base for the project, I was then tasked with absorbing as much information from materials and spending time with staff members and holding meetings with staff groups. After the information gathering and education stage, I drew up a list of proposed features that were achievable along with approx. timescale's. Once the specification was agreed I spent the next 12 months programming, designing and developing the intranet and working with staff to make sure it was reaching expectations and had the desired functionality. The code has been in production for over 1642 days (4 ½ years) and used daily by over 100 people. A credit to my programming and methodologies and project managment. I did not setup GamingFusion.com, I got involved with the project after my work with Half-Life Fusion mentioned bellow, approx 6 months after the project was setup. 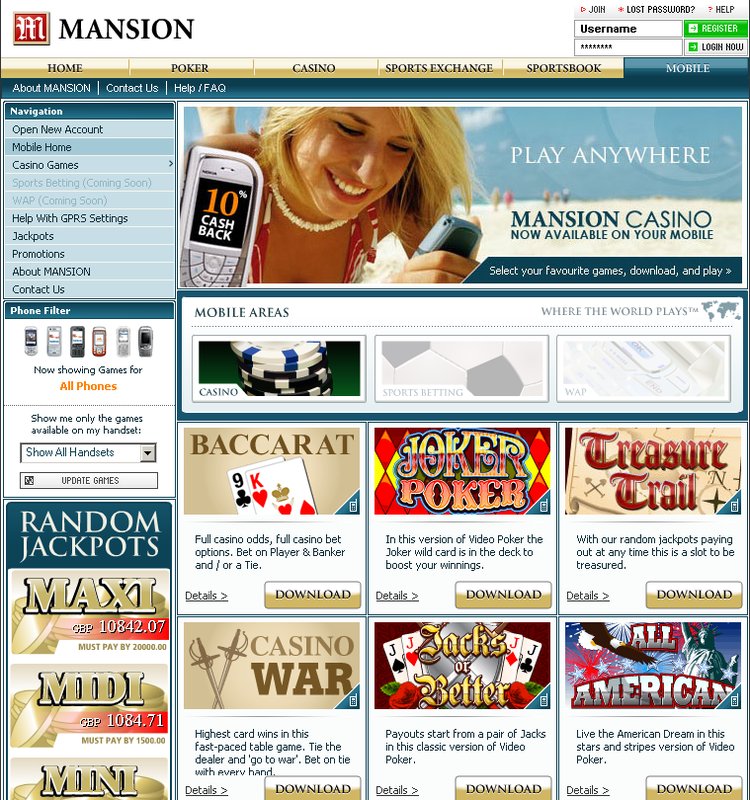 A large number of network sites/portals to service the online gaming market and their communities. Over 30 sites were active at the peak of network growth, that's 30+ webmasters, 50+ staff and a lot of content being delivered. 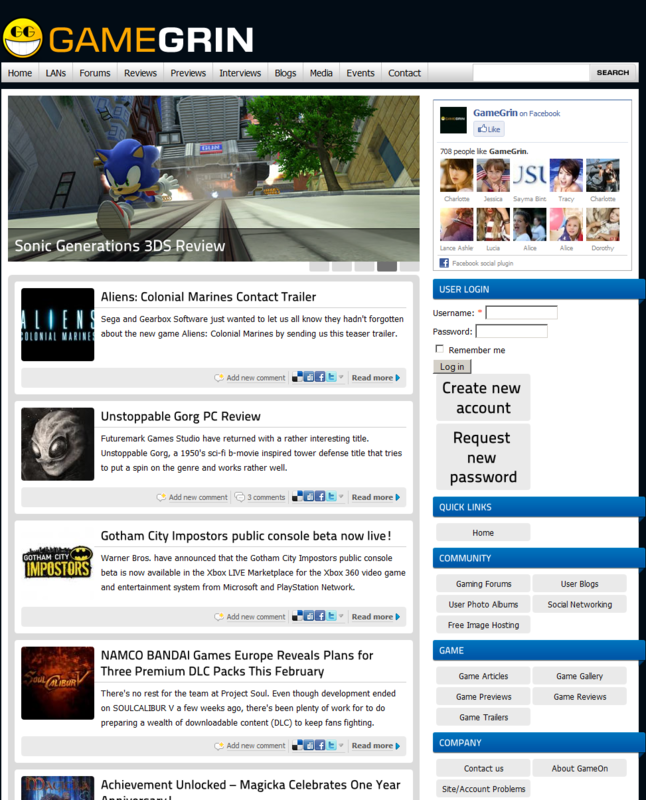 Each site/portal covered a specific game or scene. 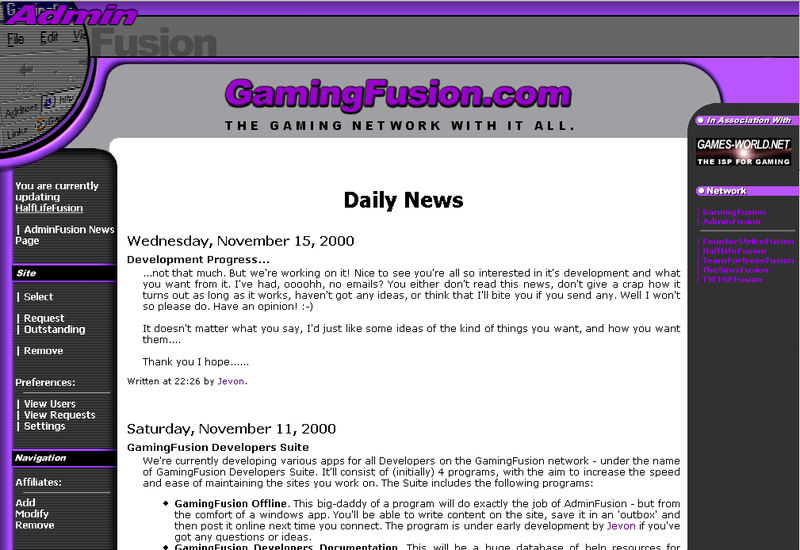 The mother-site gameingfusion.com was the hub which had highlights from all sites along with network news and corporate info. This involved some well thought out programming to service a busy network of sites all with a centralised web administration with push-button content authoring. 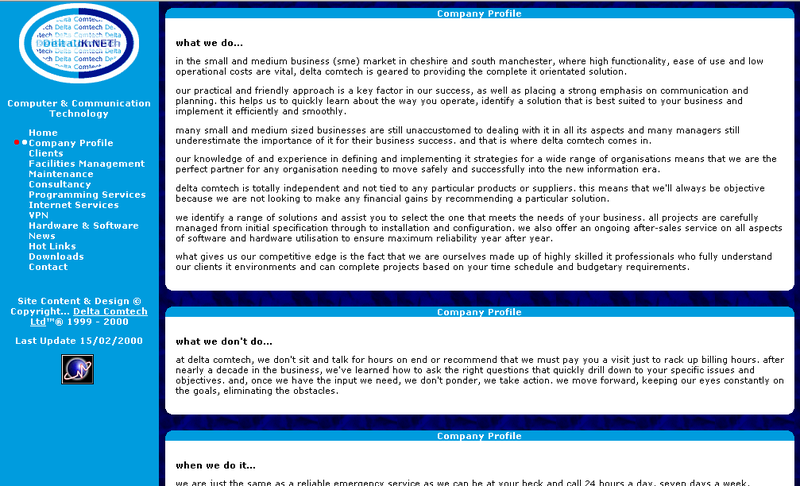 I took on an operational role which covered a lot of different aspects, some coding, some design work. My main focus was on ideas and plans to take the network forward and I was in constant meetings and talks with sponsors and suppliers to make things happen. As the whole project was worked on in personal time and due to many of the project leads having constant challenges with Real Life™, the project was halted and the network was closed down after being operational for approx 12 months. 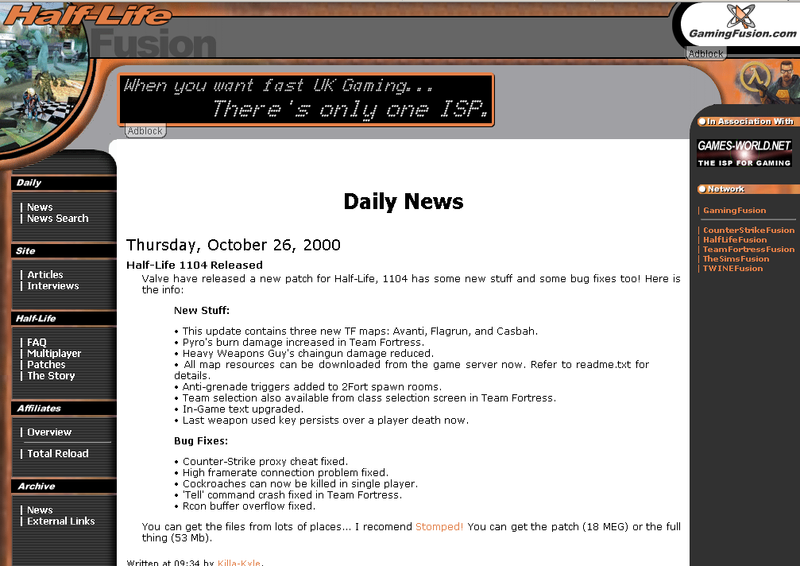 Having being recognised for my efforts with hlcu.com I was head hunted by gamingfusion.com to run Half-Life Fusion. 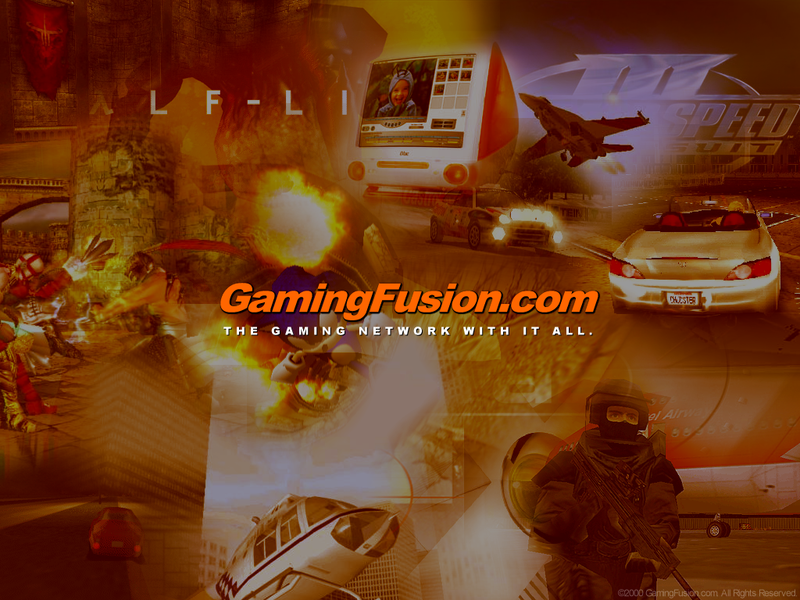 Half-Life Fusion was the Half-Life community for the GamingFusion.com network, a busy site mainly focusing on scene news, previews and reviews. I was the webmaster and responsible for all aspects of the site. I worked hard with other communities to generate traffic to the site and retain a daily readership. I wrote and ported a large volume of content from the hlcu.com. 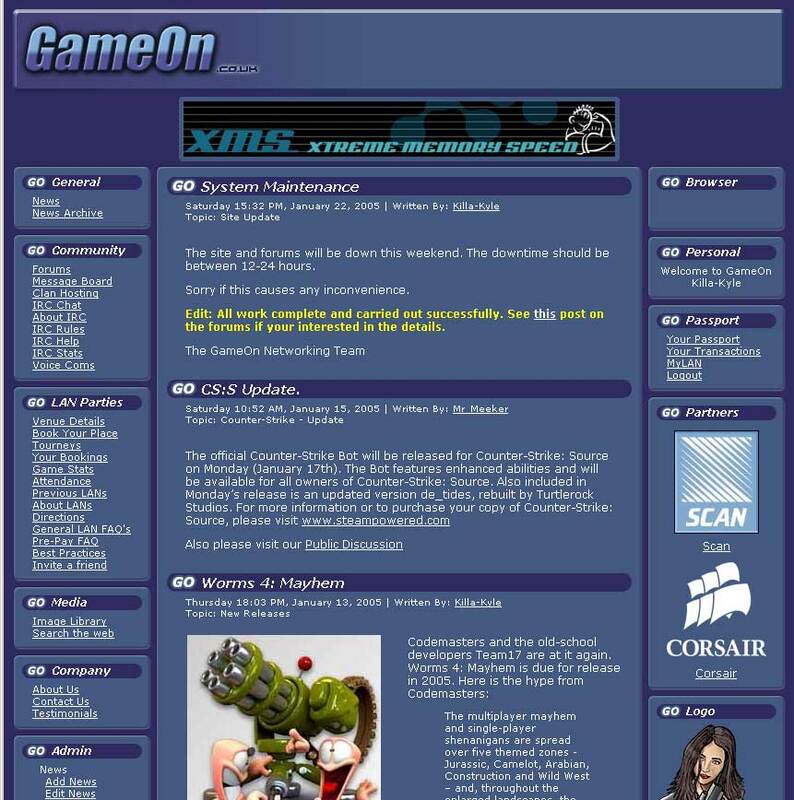 I was the liaison with other scene webmasters and communities to maintain links and relations with GamingFusion.com and Half-Life Fusion. Technology: Is now HTML, PHP, MySQL was ASP, ADO, Access, Flash. This project was a milestone in my personal development because it was my first dynamic production website. 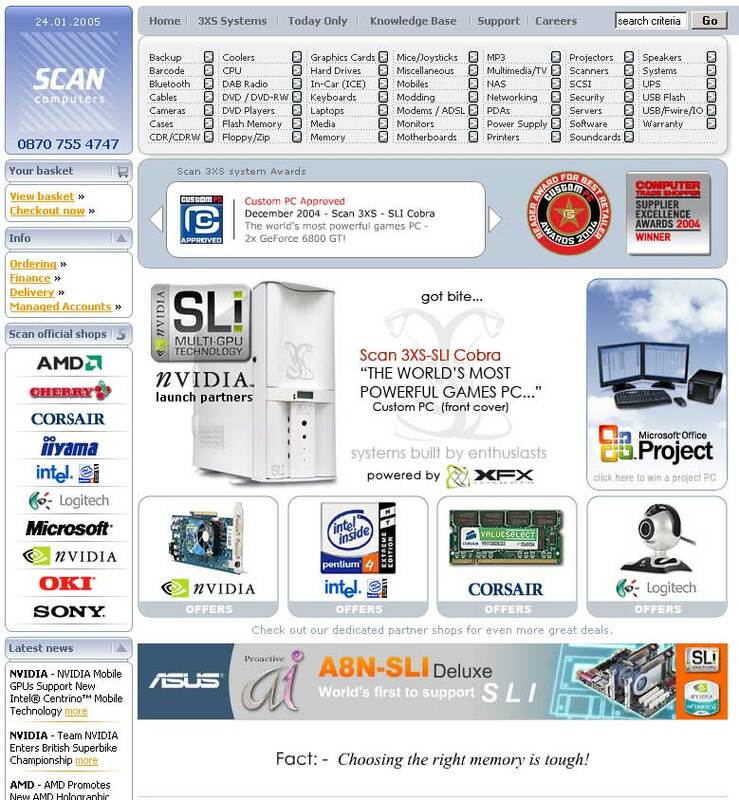 The first generation of the site was ASP/ADO/Access driven with full CMS system. The next generation of the site is PHP/MySQL driven with all the technology I've developed over the years, it is in the process of being plugged into my PHP CMS system which can handle infinate sites and templates. This website started out as personal endeavour due to having a lot of passion for the revolutionary first person shooter game developed by Valve Software named Half-Life. The popularity for the game was massive and in *Movie Industry* terms it was a worldwide blockbuster which raised the bar in the games industry by the largest amount since the dawn of 3D FPS games, namely Doom. You can find more about the game at the website here. I started out putting together guides and tutorials for various aspects of the game along with bits of news and happenings from the community. I soon realised, with the aid of some basic web statistics that my site was getting a lot of hits and regular visitors. This threw fuel on the fire and I pumped more time into developing the site features and content. This had great effects on my HTML and design skills and I got a lot of satisfaction from doing something useful and helping others to do more at the same time as improving my skills. Over the years the site has served approx 54,000 people with 20,000 referrals from search engines and 7600 referrals from website's. During my employment with Delta Comtech I was given the task of bringing the website in-line with current expectations and technologies (for 1999). This was to reflect the professionalism and wide range of services available to new and existing customers. The Urology department of Leighton Hospital, a trust within the NHS had a budget for a departmental website to be developed. 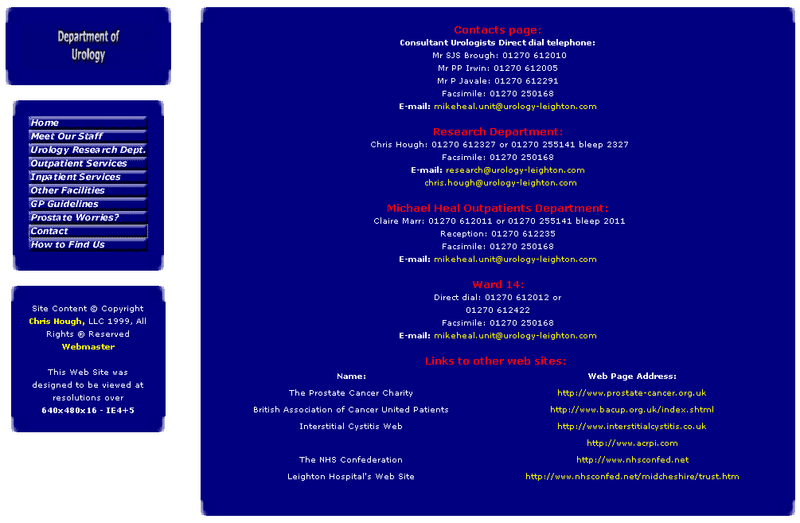 In 1999 this was viewed as quite a unique thing, as it was not common place for a Hospital department to have a public facing website, so it was good fun and challenging to be able to show it was a worthwhile feature of any department. Once the design and specification was signed off I went about crafting all the pages and filling the site with content whilst keeping the Navigation uniform. I learnt the value of sticking to the original specification with this project, and I have since introduced penalties for specification changes once the project has reached the development stage.